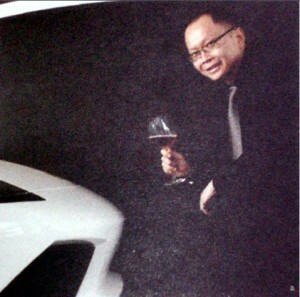 Having launched the 2009 models of what would be the most exotic and prestigious sports car, Lamborghini Indonesia chief operating officer Endy Kusumo expresses his optimism that there is enough space for the Lambo market in the country. Born on July 11, 1970 in Medan, North Sumatra, Endy is often mistaken for his age owning to his youthful appearance. But don’t take the façade for granted because this energetic and easygoing man is indeed the architect behind the operation of PT Lamborghini Indonesia, the Indonesia’s sole dealership of Lamborghini cars. In fact, the Lamborghini’s look reflects in the design of not only the car itself but also his office space and the entire showroom. During the launch in February 2009, which also marked the opening of the first showroom in Indonesia, Lamborghini introduced two of its six models – Gallardo LP560-4 and the Murciélago LP640. Could you brief us the difference between the latest two models available in the showroom? How confident are you in the products? Let’s start with the 10-cylinder Gallardo LP560-4. This four-wheel drive has a 552-horsepower V-10 engine that can hurtle to 100 kph in just about 3.7 seconds before reaching its top speed of around 320 km. The 12-cylinder Murciélago LP640 is even faster with the V-12 having a 640 horse-power. Truly, the Murciélago LP640 is the faster sports car in its class. It’s a tough question, indeed, since we only have two models available here in Jakarta. And the two represents the Lamborghini’s latest improved technology with a better performance and look yet maintaining the car’s energetic sporty model. But if I have to prefer one out of the best two, I would say that the Gallardo LP560-4 model is what I favour. It’s just a matter of preference. How about the colour preference? Yellow! Not only the colour does give an elegant nuance of a sports car, but this is the colour of Lamborghini symbol. How prospective is Indonesia’s market for Lamborghini? The two models have thus far attracted Indonesian premium buyers. In fact, few Jakarta’s crème de la crème have placed an order before having the car delivered a few months after. Al though targeting upmarket niches, the actual target market is actually those sports car enthusiasts. Those buying high-end vehicles are usually the ones who like to add Lamborghini to their collection of sports cars. This applies to those who have already bought or will buy the cars. In terms of Lamborghini, you can say these people have the passion for the Lambo! What is your long-term career goal as the COO of Lamborghini Indonesia? I would like to bring the flag of Lamborghini to the point that such a prestigious car will become the icon among sports car buff owing to Lamborghini’s splendid performance as well as the car’s excellent interior and exterior. Achieving this goal will boost not only the sales but more importantly the quality of after sales services. Currently, we apply the 3S concepts, which are sale, spare and service part by doing repair and maintenance of their vehicles at best where they can do all in this show room without having to go through all the hassle and bustle procedure. This is how we deliver and consistently maintain top-quality service to our privilege customers. In few words, how do you describe your leadership style? I always hold the belief that a business cannot grow big without the help of others. In building a solid team, we cannot work alone. For this reason, I always emphasize the importance of teamwork in leading this company. Lamborghini is one of the biggest businesses worldwide. And it would have never grown without having the team member work shoulder to shoulder to reach the goal.Not only is a solid team potential to boost the performance business-wise, but the team can significantly contribute to outstanding business relationship with the partners as well as customers. What are your activities during your leisure time? I like music. I like listening to classic, pop and light jazz. I also play musical instruments like electone (a type of electronic organ), clavinova (digital piano) and classic piano. Music is really my inspiration in how I live my life…and travel, too. I like traveling and visiting new places to learn more about culture and people regardless of where I travel – be it in countries of Europe or Asia. Speaking of culture and people remains me of my keenness on language. I’m an autodidact and have picked up some language proficiencies. Other than English and Bahasa Indonesia, I speak Mandarin and Japanese. And I have been learning Italian. I’m a hardworking person. As I just mentioned that I was an autodidact, learning by experience is what has climbed me in terms of my career pursuit. Winning an achievement, however, takes more than just working hard. Challenge matters. I like challenge. You will never climb higher unless facing the challenge bravely toward being better. Also, I don’t like to compare, as I believe that nobody is perfect. As you know, the sky is the limit. That means there’s no limit. It doesn’t matter how high you go, there will be someone higher than you. So, I never compare one thing to another. Even though I regard the Lamborghini brand as the top-notch brand, I never compare it with other premium automotive brands. If you were given a chance to reborn what would you want to be? I would be whatever God wanted me to be. Regardless of the level He puts me in this life, I would always try my best to climb higher. If you want to live forever, what age do you want to live in and why? 50s. This is the age where people is wiser, more mature and more financially stable. People in their 50s tend to have the sage perception of life. How do you react at the fact that people gets older? It’s a natural thing and nothing we can do about it. So long as we try to enjoy our life while we can, there’s nothing to worry about. Do you have some tips on life or business that you can share with our readers? By Aulia R. Sungkar, published in the 4th edition of PMR Magazine S’pore, March 2009.